This page will explain how to set up Employer records in TRAKnet 3.0. What are Employers in TRAKnet? 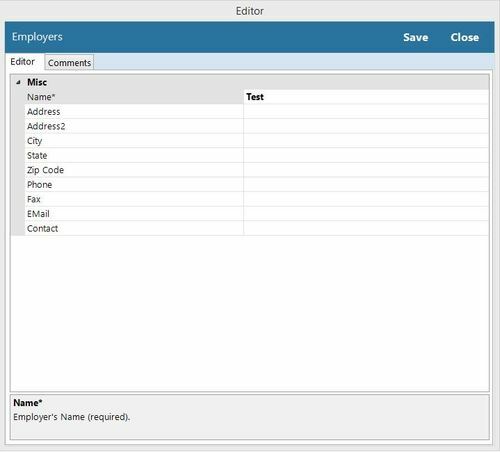 Employers are a piece of data in TRAKnet 3.0 used to populate the patient's employer under the patient's demographics. This is primarily used for billing purposes. To add an Employer to your database click on the Employers category on the Properties tab, then click the green “Add” button in the upper left-hand corner of the screen. This will open the Employers Editor window. Name — The only required field. The name of the employer. Address, Address2 — Fields to document the address. City, State, Zip Code — Fields to document the address. Phone — Field to document the primary phone number. Fax — Field to document the primary fax number. E-Mail — Field to document the primary email address. Contact — Field to document the primary point of contact at the employer. A free text field for documenting general comments about the employer.